Angel Beats! : Heaven's Door is partially based on the the novel Angel Beats! : Track Zero. The first volume of the series was published in English by Seven Seas Entertainment on February 9, 2016. However, the release of the subsequent volumes has been delayed indefinitely. Well, this is a must read if you completed anime and also loved it. I strongly recommend it to all fans of Angel Beats out there who are looking for more of it. But beware, this is not a sequel to anime. This is pure prequel(at least going by 11 chapters). There aren't many particular happenings in the story. Its more like prequel to the anime as it shows how they all met in the after world. And the fact that they all still try to sabotage Kanade, and meet the God of that world. Art is really beautiful, there are backgrounds in almost every panel, but manga itself isnt chaotic, and the pages black and white colors are well balanced. First characters we see in it are Hinata, Oyama, Kanade & Yuri. Of course, they are crazy as always, and are still trying to make chaos with Kanade's life. There is also some more character development between Hinata and Yuri, hinting that Hinata truly loves Yuri. And there is more hints to the Hinata's past. Did you love Angel Beats & didn't want it to end,wanting something more? ?Then this is the manga for you.It is a prequel to the main series,so if you want to know the events which occurred in the formation of SSS then you should definitely give it a go. I loved the main series story.A group of people spending their lives in their afterlife is definitely a interesting thing to see!The story is about Hinata & Yuri,how they formed SSS club & how other members joined it..It also explains how & when Yuri started thinking of Kanade as representative of the God. I love the story as it makes things a bit more clear.It is really interesting to see the formation of SSS & the lives of its members before Otonashi's arrival. The art is clean & very beautiful.It is neither rushed nor too empty.The backgrounds are explained carefully.The character are also drawn nicely & they look awesome.The blood also looks realistic(for any blood lovers,T_T)In other words,the art is lovable. Now,this was the one of the strongest point of the original series so why would I not like them in this manga?I love the characters of "Angel Beats"This time,the story is more focused on Hinata as he is the main character.How he meets Yuri(who,as usual,shows great leadership abilities) is explained nicely.Their are also POSSIBLE hints about POSSIBLE romance between Yuri & Hinata,about which I was not too happy as I am more of Hinata x Yui fan. This series also explains how SSS members joined the group & give more details on their past,how they died etc.So, any person who thinks that the main series lacked in character development,should definitely give it a go,as it explains all the characters more deeply & give them enough time before moving on. I am absolutely enjoying it.Its a really nice manga & interactions between the characters are lovable. 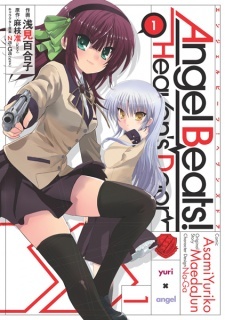 I will give it a 9 as it great prequel to the main series.So any Angel Beats fans are welcome to read this:D as it is a really nice prequel.You can also read this first & watch the anime afterwards just to be a little bit more sure on what is happening. For those who were disappointed with a lack of character backstories in the anime, rejoice, as this manga, so far, covers a couple of other characters not shown in the anime. So far it has covered Shiina, Yusa, Chaa, Ooyama and a bit more clear story of Hinata's death. I have said in my review of the anime that I was disappointed that only a few characters managed to get proper backstories. The manga, however, has managed to rekindle some of my hopes in wanting to see some other characters go into detail (T.K. and Noda mainly). The characters that were mostly kept in the dark (Shiina, Yusa, Chaa) have interesting backgrounds and had a very different, much darker personality before they eventually joined the SSS. Hinata's "death" was explained much more clearly, and we also got to see what kind of personalities Ooyama and Noda had a bit more clearly. Although we're still far from getting all of the SSS members' backstory, the content of the manga so far is definitely satisfying (although they aren't uploading that much... 34 chapters in about 3 years. Still hoping for the best though...). As for the art, it's beautiful. I expected nothing less from it. It's clean and has good character and background designs. Just like the anime, it's one of strong points of the manga. So far, I am enjoying this a lot. I probably enjoyed this more than I enjoyed the anime itself. Some good humor, fighting, and most importantly allowing us to explore into a couple of characters have been enough to make me like this manga more than I thought I would have. As I am waiting day by day for a new chapter, I'm also hoping that they somehow don't screw this up, and end it early just like the anime. (Which would be Very, VERY disappointing, seeing as how the manga panned out so far.) In the very least, I'm expecting to see at least a couple more characters go into detail, about 4-5 more. Unfortunately the waiting seems to be forever as it's been about 2 months since we got the latest chapter. However, as slow as it might seem, it is still worth waiting for the sake of wanting to know other characters more. Significance of the Piano and Music Overall in Angel Beats! Angel Beats, a popular anime that explores intense themes, has a way of making viewers laugh and cry all at the same time. One area where the series really shines is in its music, the piano pieces in particular. Let's listen to the sound of music in Angel Beats and explore its significance! With a large portion of the Angel Beats! Original Soundtrack sounding so similar, it can be hard to remember how absolutely beautiful some of the music can be. Let’s take a look at five of the most elegant songs in Angel Beats!